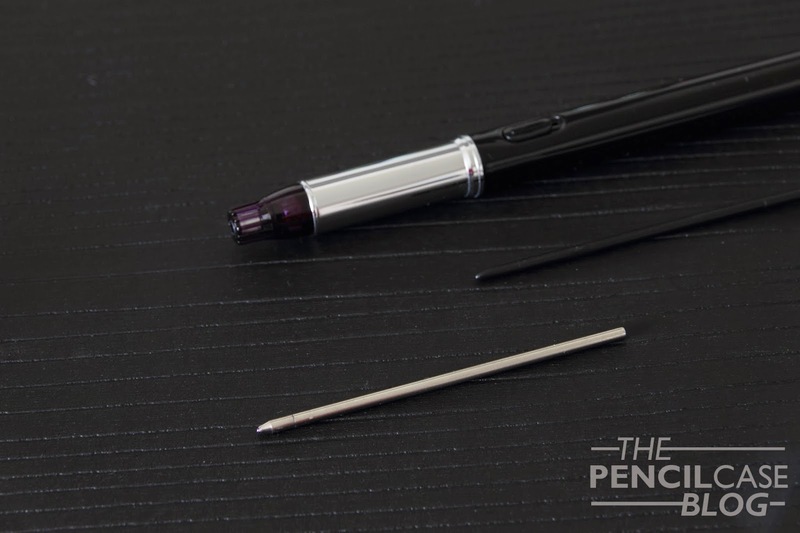 I had heard of this kind of pens before, and I've always been quite fascinated by them. But I never actually took the plunge and got one. Until today! 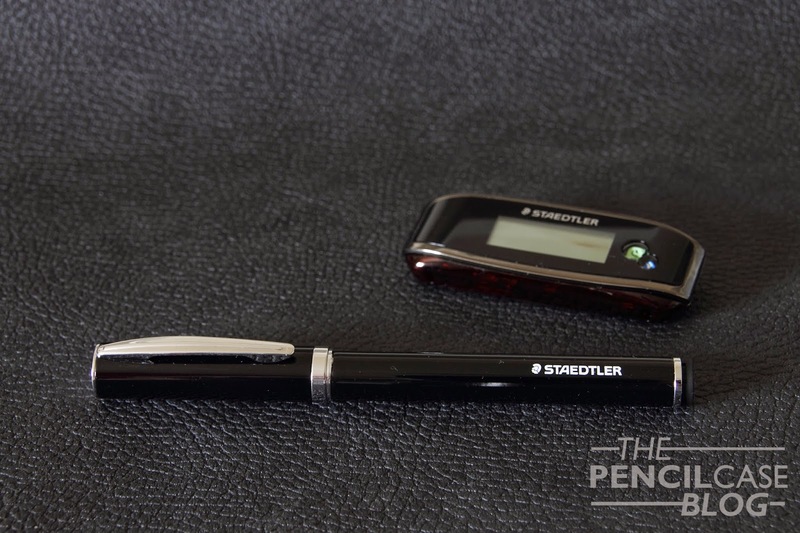 Staedtler sent me one of their new Digital pens (version 2) to try out! First things first, I was really impressed by the packaging! Or rather the case it comes in. The cardboard outer box obviously isn't that interesting, but what's neat about it is the tin that holds all the necessary parts. 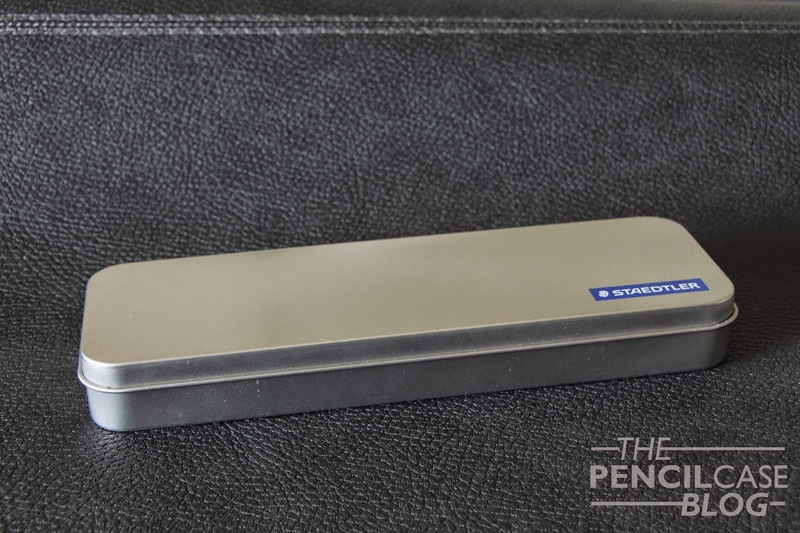 This case has foam inserts that'll prevent your digital pen from getting damaged. You'll also find a velvet pouch in the box, which is useful if you just want to take the pen and receiver with you to travel more compact! Other than that, you'll also find three CD-ROMS with all the necessary software for both ios and Windows computers. Obviously, you won't buy this pen for its looks. To be honest, it's not pretty at all, and it looks boring. In fact, none of the digital pens I know of look good! Luckily, the build quality of both pen and receiver are very good! The only 'issue' I found was that the cap of the pen would wobble a bit. 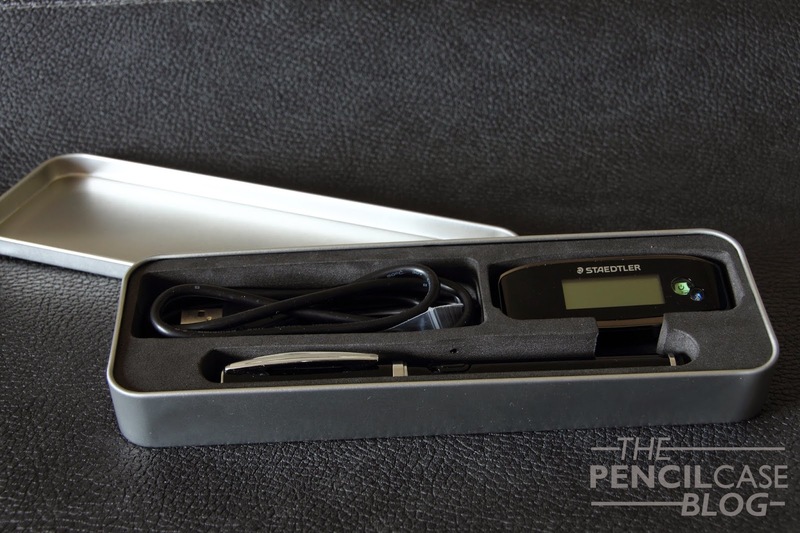 Getting everything ready is quite easy, the software is easy to install and the pen and receiver (the little rectangle thingy that 'reads' your writing) can be charged with the mini-USB that's included (The pen has an 8h battery life, the receiver even longer, charging takes up to 5 hours). The general use of the system isn't too complicated, though I'd recommend downloading the manual nevertheless! The software is ready to read and convert written text into digital text, though it could be useful to do the 'MyScript Trainer' first (MyScript is the included conversion software), this writing excersise gives you a series of letters and symbols, but also words and sentences to write, which are then coupled to the digital counterpart to make sure what you write is what the software will 'see'. The writing samples from the MyScript Trainer. But, how does it work? Well, it's actually a pretty simple concept: an infrared source at the tip of the pen gets picked up by the receiver every time the pen touches the paper, when that happens, the receiver calculates the coördinates. So in the end, there's a 2D vector image with all the recorded coördinates of where the pen touched the paper. First of all, the instructions show that the receiver has a certain 'service area', the place on the paper that will be recorded, which is about a centimeter or two fifth of an inch from each border and a bit more from the top (because that's where the receiver is). When writing too close to the receiver, or too close to the edges of the paper, you'll distort the image. Also, you'll have to make sure not to move the receiver while writing, obviously that would also distort the image. 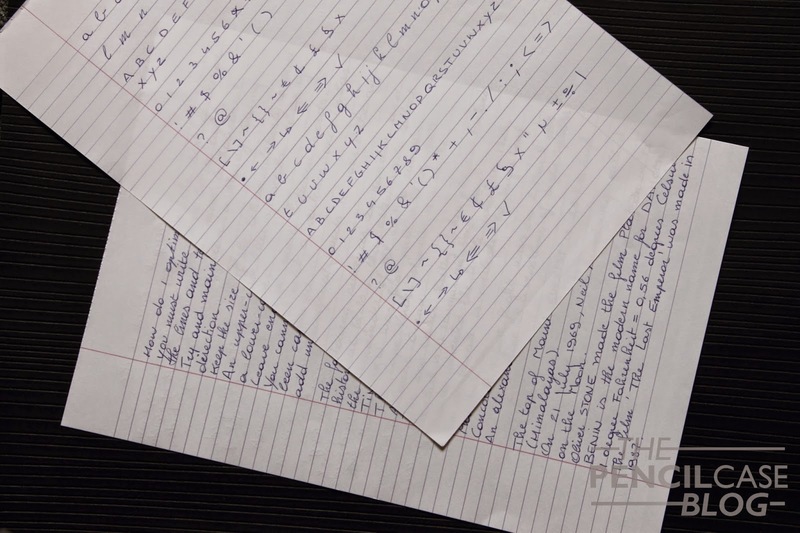 And last but not least, your writing has to be consistent and the letters shouldn't overlap, because the software converts your writing based on a model, the letters should be fairly consistent in comparison to that model, and overlapping will make it impossible to 'read' the letters. Oh, and the receiver can only record up to A4 sized paper, smaller paper works just fine, but larger paper won't! So... no, it doesn't always work perfectly. But decent results can be obtained when you keep the tips I mentioned above in mind. And in case things do go slightly wrong, you can still correct them within the software before copying or saving the digital text. 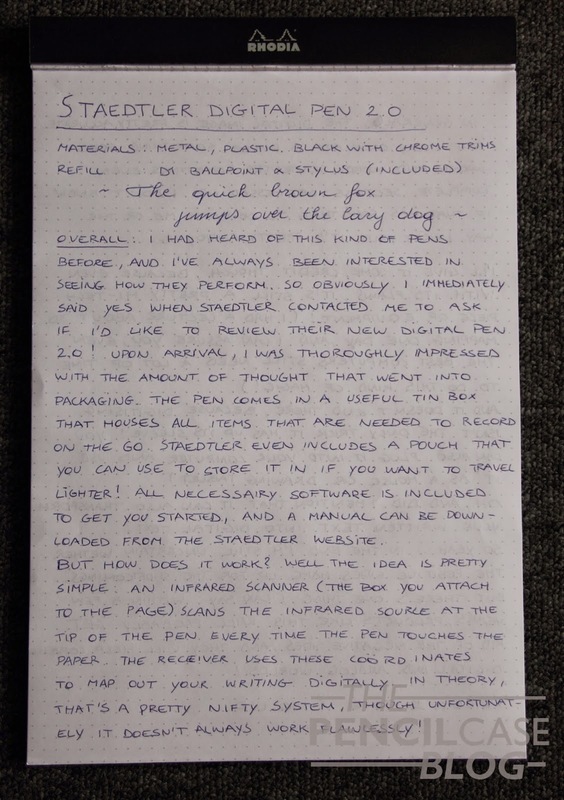 The written review (as seen below, both in analog and digital form) I wrote wasn't perfect, as you might be able to see. But then again, I really pushed the receiver to its limits, which you obviously shouldn't! though I managed to 'clean up' the converted digital text in a matter of minutes, still many times faster than if I had to type everything from scratch! As for the pen itself, it is filled with a D1 type refill, so there's plenty of refill options readily available! The refills (three, all blue ink) that came with the pen performed pretty well. As you can see, the receiver almost overlapped with the first line, which causes some distortion. But it doesn't end there! When you connect the receiver to your computer, It'll also act as a drawing tablet or mouse! Included with the additional refills, you also get a plastic D1 refill, so you can 'write' on a table or other surface without actually damaging it! The receiver can even connect to your apple or Blackberry device via Bluetooth to transfer the images directly to your mobile device! In the end, I think you get decent value for money. 125 Euros/ 150 USD isn't really that much considering the amount of technology you get in return! Yes there are some occasional hiccups, and you have to abide by some rules in order to get decent results. But once you get the hang of it, this pen can really make life easier. 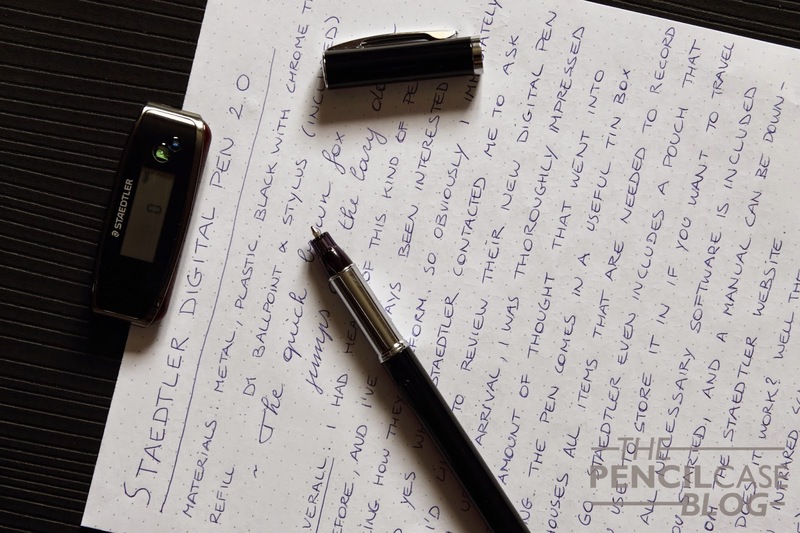 Especially for students or business people who still like to take notes the old fashioned way, the digital pen will help you save time transferring all these notes and sketches into digital files! 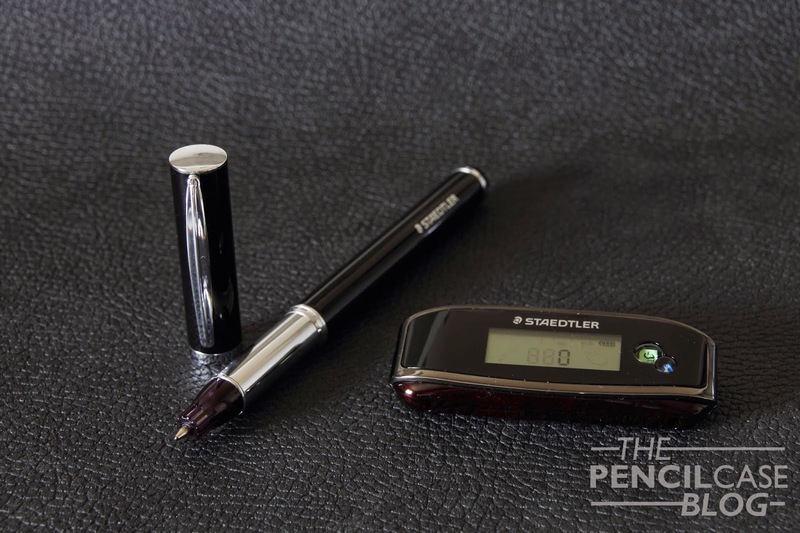 Note: this pen was sent to me by Staedtler., free of charge, so I could write this review. I was in no way influenced in the making of this review, nor was I monetarily compensated. The opinions shared in this review are completely my own! The conversion software with the final result on the right. I bought mine but I cannot get it to work. I think the pen may not work. 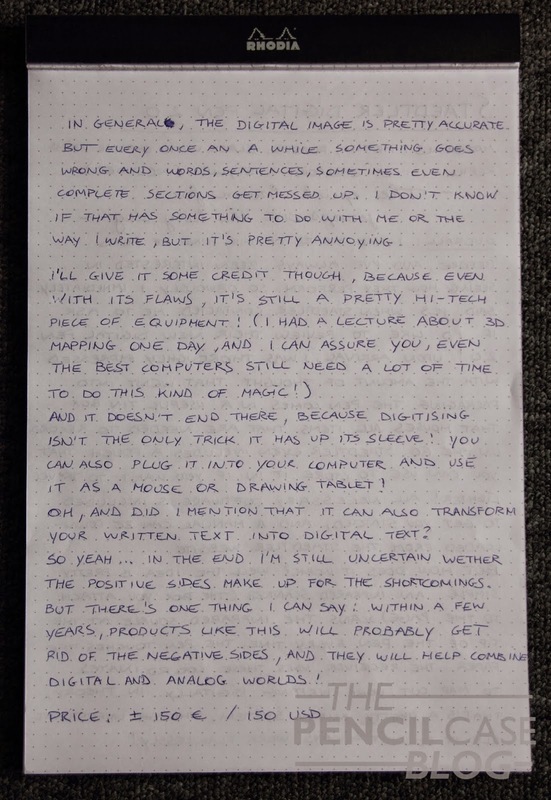 Hm, definitely try contacting Staedtler directly, or maybe the store where you bought it?